Awards to be given in Washington DC during next month's partner conference. 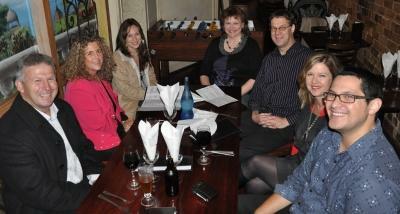 Louis Nunn, Barbara Plester, Chantelle Te Hira, Sue Willems, Gerard Willems, Karen Nunn and Josh Te Hira. Express Data has recorded New Zealand’s first win in Microsoft’s global Partner of the Year awards, scooping the Distributor of the Year prize over 53 other entrants. Intergen will also take the stage when the awards are presented at the international conference in Washington DC next month, having secured the inaugural Country Partner of the Year for New Zealand. It was one of five firms to submit an entry for this award. Until now, a New Zealand partner’s highest achievement in the global awards was Kinetics Group’s finalist placing in 2008. 28 local entries were submitted globally this year, compared with seven last year and 24 the one before that. Express Data sales and marketing manager Paul Plester says it has worked to complement Microsoft’s business in the past 12 months and has focused particularly on the second tier channel. “We have staff with significant licensing expertise and it is passing that knowledge on to the tier two resellers. That was a major part of the submission,” says Plester. In the past year it has also partnered with Ace to offer basic level training in pipeline technologies including Exchange, so partners can assess new features and develop confidence in recommending these technologies to customers, says Plester. It also ran more in depth training sessions on specific programmes, such as Dynamics CRM, he adds. Plester says the distributor has won many Asia Pacific region vendor awards, which are usually based on sales performance, but hasn’t entered the global Microsoft partner awards before. Express Data’s Microsoft business manager Louis Nunn is on Microsoft’s international Distributor Advisory Council, which has helped the company get insights from the global business, says Plester. He adds Express Data New Zealand is the only distributor in Australasia represented on that council. “Express Data New Zealand has developed compelling solutions that have strengthened their market position,” says Birger Steen, the vice president of worldwide SMB and distribution for Microsoft. “Express Data focused on growing their Microsoft non-managed partner base by creating solutions that have grown their total Microsoft business 40 percent year on year, increased partner satisfaction scores, and achieved double-digit increases in profitability for the Microsoft line, providing them with a true competitive advantage." Intergen managing director Tony Stewart says the breadth of its relationship with Microsoft and being able to demonstrate measurable results for clients were key factors in its win. Intergen also has international ties with Microsoft, helping with new software releases at the vendor’s headquarters in Washington State, says Stewart. Locally it partners on developing solutions on Microsoft’s platforms, sponsors hands-on labs and providing speakers for Microsoft events. Intergen has entered the global Microsoft awards each year since 2002, Stewart says.